Only took about 30 minutes, placeholder quality? looks retarded from that angle haha. I had an interesting save/load problem where my player character would load a short distance away from my boat instead of on it, maybe a physics issue? Changing the execution order to saving the boat location before the player location fixed it. Just thought I'd mention it. Hey how do I make a crabbing game with this. Little too broad. 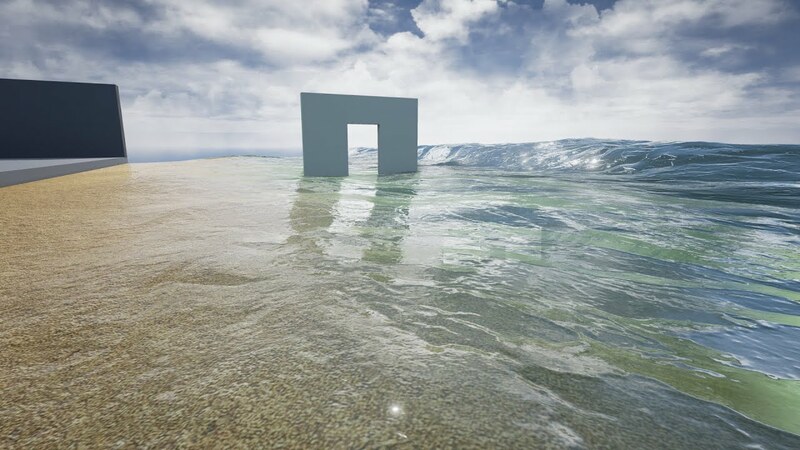 You'd need a boat, and blueprints/C++ to handle every aspect of the game, and depending on how you want to traverse the seas, origin rebasing or world composition. If your trying to make a "Deadliest Catch" game. Its been done, and it failed horribly. Lower waves on the beach would be nice. As in the video below. First of all: Great Work, Guys! Now I got a problem with the Buoyancy, that I was not able to figure out yet. My Buoyancy Objects and my waves are not synchronous. My Boat moves up the wave, when the wave did not even reach the boat and moves down in the middle of the wave. Looks like its just shifted by PI. Maybe you guys can help me on this one. Last edited by Crafty; 07-19-2015, 03:32 PM. If I add a physics constraints component to my boat it starts spinning ferociously, I assume that it somehow messes with the buoyancy. Any thoughts?